Ebside Productions provides software solutions for the broadcast and video production industries. Please contact us about any custom software or applications that require the experience of a company dedicated to film & video production and video asset management. More information and screen shots. Control almost any video device whether analog or DV. Control RS-422 & RS-232 devices via serial port or control any DV device via IEEE-1394 firewire. 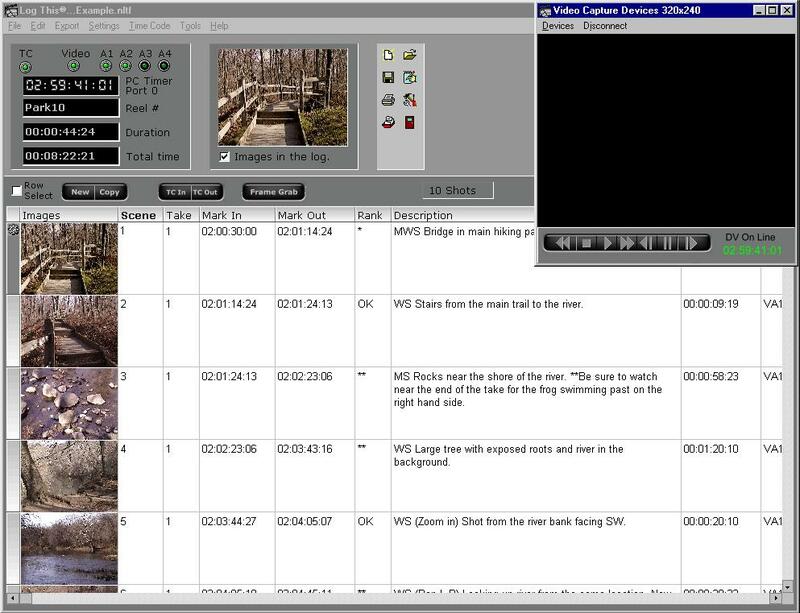 Dynamic user interface with the ability to wrap text within each cell in the clip, drop down selection for ranking clips, hide columns, and a new toolbar panel. Advanced printing functions that include, fit to page, user defined headers and footers with page numbers, first row repeat, date and log title. "Export Manager" lets you select where the log data is placed in your EDL or batch digitize list. Create HTML based pages with video thumbnails from your logs. Includes links between pages for multi-page output. Great for project pages, client emails, or archiving records. Support for many export formats including Adobe Premiere, AVID, edit*, Final Cut Pro and Media 100. Windows 98SE (Second Edition) or higher. 90 MHz. Processor, VGA (640 x 480) 256 colors, 64 meg. RAM, 8 meg. Hard Disk space, open serial port, CD-ROM drive. 600 MHz. Processor, SVGA (800x600) 16 bit color, 128 meg. RAM, 20 meg. Hard Disk space, open serial port, CD-ROM drive. *Note: Any company names and products on this page are the sole property of their respective owners and appear only as a reference to the product. It in now way implies any relationship between any of the companies and Ebside Productions.